Below is the sightseeing spot I provide the guiding service. 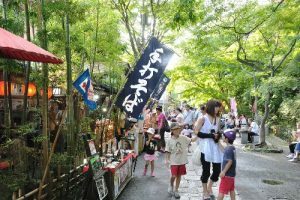 Jindaiji Temple is the second oldest temple in Tokyo. It is well-known for its divine favor of matchmaking derived from its history. Lovers who were separated by her parents prayed to Jinja Daio and were permitted to get married. And their son established the temple to enshrine Jinja Daio. We can see a national treasure, a Buddha statue, made more than 1300 years ago. 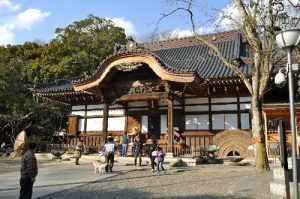 Jindaiji Temple is famous for soba (buckwheat noodles). 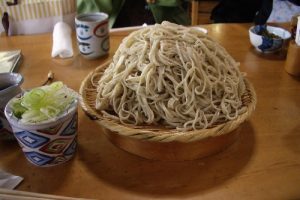 Rich water and good-quality buckwheat made the noodles a local specialty in Edo-era (about 300 years ago). There are about 20 soba restaurants around the temple. 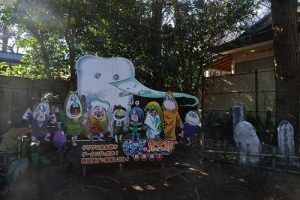 On the frontal road, there are a teahouse features a manga “GeGeGe no Kitaro”, sweet parlors, a gardening shop and many other shops including selling lucky Daruma dolls. 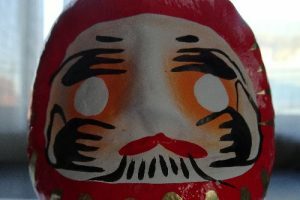 Paint one eye of Daruma with your wish and when your wish is granted, please fill the other eye. At a ceramics shop, you can paint small items such as a chopstick rest or a teacup and take the finished goods with you as a souvenir 20 minutes later. 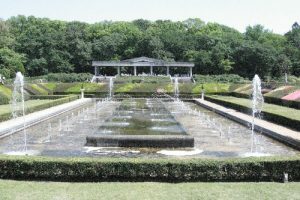 If you are interested in flowers and plants, we can go to Jindai Botanical Garden next to Jindaiji Temple. It takes about 30 minutes from Shinjuku, the largest station in the world, by train and bus. Why don’t you spend your time slowly around a suburban temple? I am a freelance translator and I have translated English books (fiction and non-fiction) into Japanese for more than 20 years. I enjoy translating but I also want to have a job to meet and talk with people so I got the license of National Guide in 2010. I have guided many people as a professional and a volunteer guide. I am Edokko (Tokyoite born and raised in Tokyo for more than three generations) and have practiced tea ceremony for more than 20 years. I know Tokyo’s history and culture very well. I will make a plan that you’ll really experience and enjoy Tokyo and Japan. Please let me hear your requests. My guide fee is 3,000 yen per an hour up to 5 persons. Additional person’s fee is 500 yen per person per an hour. In addition：transportation fees and entrance fees. Please read my proposal carefully. I will make every effort to make your trip pleasant. I will e-mail my proposal to you if you consider to request my service. We just wanted to thank you for the incredibly fun and memorable day we had seeing the highlights of Tokyo with you! We got to see and experience a lot more of Tokyo with you in one day than we could have possibly done on our own and it was so fun and informative too! 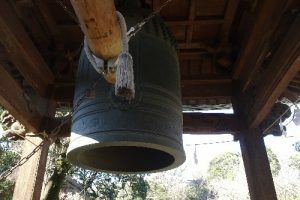 Your extensive historical knowledge shed light on Japanese religion. Your ideas on places to see or visit throughout the day helped to cater to everyone’s interests in a family. We didn’t just “see”- we got to experience it! You found something of interest to everyone and made our day into a beautiful memory! Many thanks for guiding us today! ERF will inform me of your e-mail address, your name and other information. Then I will contact you by email. I will send you “my guiding proposal” by e-mail, so please read it and determine whether or not to request my service. Please let me know if you have decided to request my service. I am looking forward to your request.